Cymax Stores, based in Vancouver, BC, is North America’s largest online only furniture retailer with annual sales that exceeded $100 million in 2013. With over 50,000 furniture SKUs, Cymax is a leader in online sales for all items home and office. Currently #197 on the IR 500, Internet Retailer’s ranking of the Top 500 players in eCommerce, Cymax Stores has big growth goals over the next few years. The simplified sales process of Amazon Pay led to a 3.15% increase in conversions after the log-in integration. 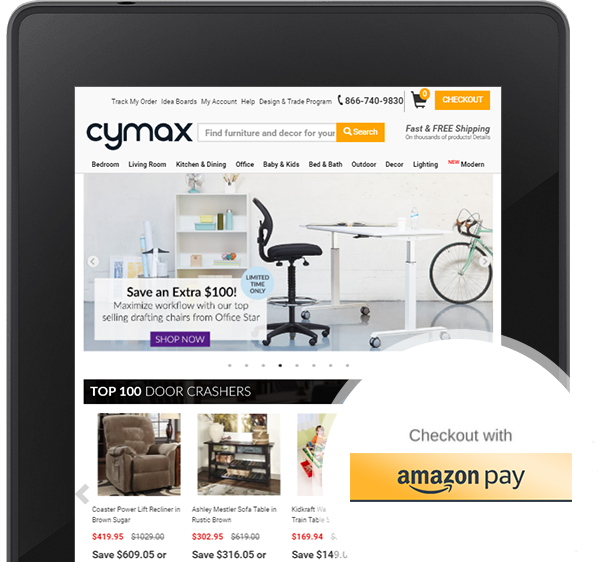 In June 2013, Cymax adopted Amazon Pay, and in October upgraded there offering to enable both account creation and easy payments. Amazon Pay became the most preferred payment method on Cymax.com, accounting for over 20% of all orders. After Cymax added Login with Amazon to the experience, they saw new account registrations on Cymax.com triple in the first three months. "We’ve been delighted to see more customers register on our site because Login with Amazon is easy and familiar. Having more identified customers means we can better target our marketing campaigns, and grow our sales." When Cymax added Login with Amazon to the experience, new account registrations on Cymax.com tripled.